Caroline Tocci (left) and Ashley McNiff (right) at the VTM Foundation 5K Walk/Run on June 17, 2017. [Ashley] How do you explain the mission of the Foundation? [Caroline] The mission of the Foundation is to help empower women to live life without fear- whether that be the fear of harassment, fear of assault, or any other fear that prevents women from living their best lives. After Vanessa was killed, we knew that we had to create a foundation to honor and memorialize her, but we also wanted our foundation to help prevent this from happening to other women. When we were trying to define our mission, we knew we wanted to address the issue of female safety awareness, but we also wanted to tackle the bigger societal issue at hand. When women are harassed or assaulted, our culture tends to focus on the victim and push for female safety, which is definitely important, but safety alone will not reduce violence against women. We wanted our foundation to help our society put more focus on the perpetrator. Why is there violence against women? Why do men harass women? Although there are many answers to these questions, one reason is the issue of objectification in our culture. If women are viewed as objects, it is easier for men to treat them as lesser- whether that be with assault or even just catcalling on the street. To reduce objectification, we need to advocate for gender equality and challenge the gender stereotypes prevalent in our society. [Caroline] We have big goals for the Foundation! What do you think is most important for our donors to know about how we plan to carry out our mission in the next year, and in the future? [Ashley] Our mission is really, really challenging thing to address. There are so many factors that contribute to objectification and harassment against women. Research shows that many of these factors are social issues that are rooted in gender inequality. It takes a long time, and a lot of work, to change the way a society thinks and acts. We know that gender inequality is often at the root of objectification and assault against women. In the near-term, we will be focused on investing in gender programs that address these issues among future generations (middle school to college). We believe that educating younger generations on these issues will lead to less objectification over time. The types of programs that we will invest in focus on redefining gender stereotypes, both male and female. We will also focus on promoting female safety awareness, like self-defense. I really hope that someday, future generations live in a world where self-defense doesn’t have to be a female priority. In a way, it’s putting a blanket over the larger issues that lead to violence, harassment, and objectification of women. However, I think we all know, through statistics, and from what happened to Vanessa, and many similar tragedies, that this does happen. Of course, our main goal is to prevent these situations from happening altogether. But in the meantime, we want to do whatever we can to equip women to be safer, so they can live their lives boldly without fear - whether is be fear from going on a run by themselves, walking down the street confidently, or speaking up for themselves or what they believe in. In the future, I see us continuing what we are doing but on a much larger scale. I think we have a lot of work to do to figure out how we do that, in the most impactful way. We’ve started to establish our “VTM Advisory Council,” a network of subject matter experts in gender studies, violence against women, and safety awareness. I think we will lean on them a lot in our initial stages to help us inform our future road map and direction. 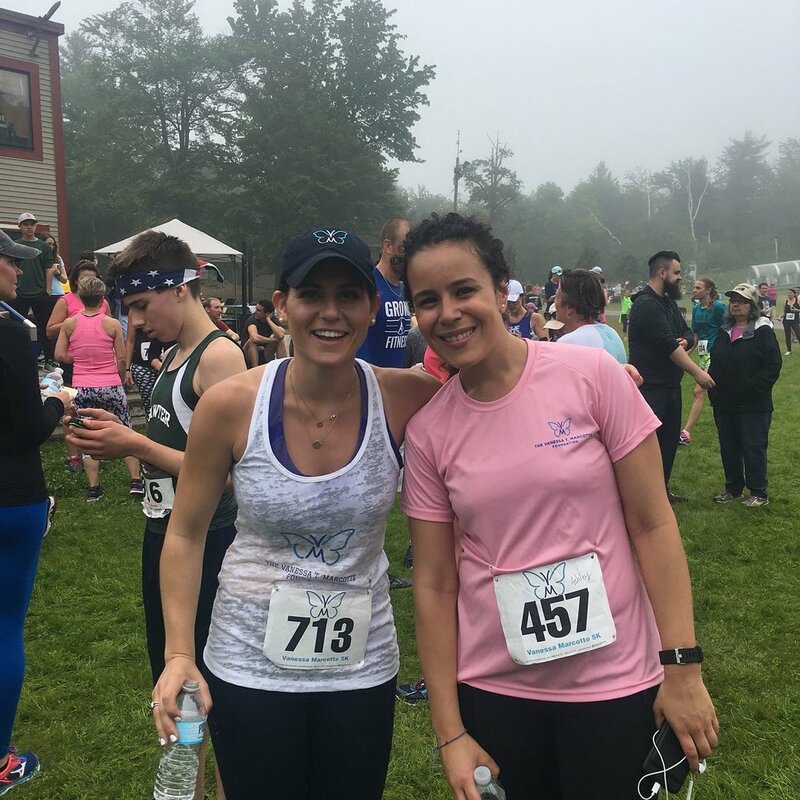 Ashley McNiff (left) and Vanessa Marcotte (right) before the Brewster Brew Run in August 2015. [Ashley] Vanessa is the inspiration behind our mission. I think both of us agree that channeling our energy into the foundation has helped us cope, and has helped Vanessa’s passions live on. What do you think she would think of our mission and our work? [Caroline] Yes, I definitely agree. I think Vanessa would really believe in our mission because if this happened to either one of us, I know she would work to make sure this didn’t happen to anyone else. The first time I remember being catcalled was when I was with Vanessa, walking down a street when we were in our early teenage years. To think that we were barely high schoolers and we already had an uncomfortable experience around men is pretty unsettling. As adults, we often had conversations about gender inequality, whether it was talking about moments at work when we experienced sexism or sharing a story about feeling unsafe walking home at night in NYC. Vanessa would be so proud and impressed with our hard work during the most difficult year of our lives. I know she would also feel so honored that thousands of people have joined our fight for a world where women live boldly and fearlessly. [Caroline] What do you think? [Ashley] I agree. I also think it's important for us to continue to embody her passions through our work. That’s how she will live on. I always remember Vanessa in her natural element, her happiest places, running, being active, being around everyone she loved, laughing. She would love that we are trying to embed that into all of our events, like our inaugural 5k on her birthday, which is exactly the kind of birthday party she would have wanted, or our Falmouth Road Race Team, one of her favorite races, in one of her favorite places. I also know that Vanessa would be so proud of our commitment to being social change agents. She would think what we are trying to do is huge, so important, so critical, and she would be so behind it. I was always so inspired by her commitment to giving back. She literally aspired to change the world. She inspires me everyday to make the Foundation successful, which she would define as having the biggest impact, on the largest amount of people. [Ashley] What are you most proud of accomplishing since establishing the foundation? [Caroline] I’m proud of everything we’ve done since starting the foundation- I still can’t believe how much we have accomplished while still grieving Vanessa’s loss. The foundation has definitely helped me cope, as you mentioned before, but it is still amazing that we’ve been this successful. If I had to choose one thing, I’d say that I’m most proud of having over 1,000 people come together at our first 5k event on June 17th. When we first started planning the event, I imagined that we’d have about 300-400 people. Seeing the large crowd that day was an amazing feeling. It was especially comforting to have old friends, acquaintances, and even strangers tell me how impressed and inspired they are by our work in Vanessa’s honor. Vanessa Marcotte (left) and cousin Caroline Tocci (right) after the Falmouth Road Race in August 2014.